Roses are expected to thrive in your garden for up to 10 years. Soil preparation is therefore the actual important aspect when planting a rose. Select a good sunny spot that enjoys good air circulation. Roses can however also grow in an area that enjoys dappled sun light, where trees have been cut quite high to let in enough light. They need a minimum of 6 hours of sun a day. Dig a hole 50cm deep and wide. Fill hole with water and leave it to drain. If you are planting several roses prepare the entire bed in the same manner. Add large quantities of compost to the dug out soil to ensure good drainage and aeration. A good rule of thumb is half compost, half exisitng soil. A handfull of bone meal can be mixed in as well. Fertiliser should not be applied at all! Our Planting Mix is ideal – you can plant 3 – 5 rose plants with one bag – its marvelous stuff! Bone meal does not have to be added to this rich compost. 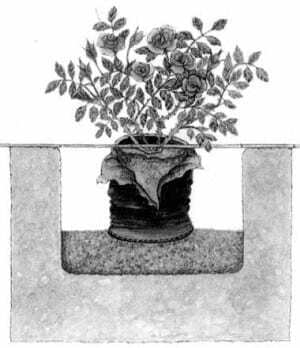 Fill the hole with enough mixed soil to place the rose at the correct height, remove the plant from the bag or pot. Position the plant – the bud-union must eventually be 4cm below the surface of the soil. Fill more enriched soil around the plant, compress the soil and water well. DO NOT USE ANY FERTILISER WHEN PLANTING!!!! Fertiliser is only applied one month after the newly rose has settled into its new home. To be effective, the spraying of roses for the control of pests and diseases needs to be carried out properly and with the correct understanding of both the pest and the applicable pesticides. Pesticide is the generally understood term for chemical compounds which control insects and diseases on plants. Read more about environmentally responsible pest and disease control, benefical insects and much more in Johan Gerber’s book called The Garden Guardian, Aardvark Press. Rainy, humid weather conditions – on a weekly basis. To be able to control the different pests and diseases one combines several pesticides in a ‘COCKTAIL’ to avoid having to spray the roses several times in one week. Pests and Diseases become resistant to specific chemicals if these are used continuously. For this reason it is good practice to alternate the pesticides. Approximately one litre of spray solution is needed for 10 roses. Mix powders first in a small quantity of water then add to the rest of the water. Warning : Pesticides can be poisonous – so please practice caution when using them. For powdery mildew, black spot, aphids, boll worm, stem borer, thrips and beetles. For black spot, downy mildew, aphids, boll worm, beetles, thrips & stem borer.